Are you fed up of logging in to all of the different services you’re on, such as Twitter, Facebook, Flickr, Google Reader and Digg? 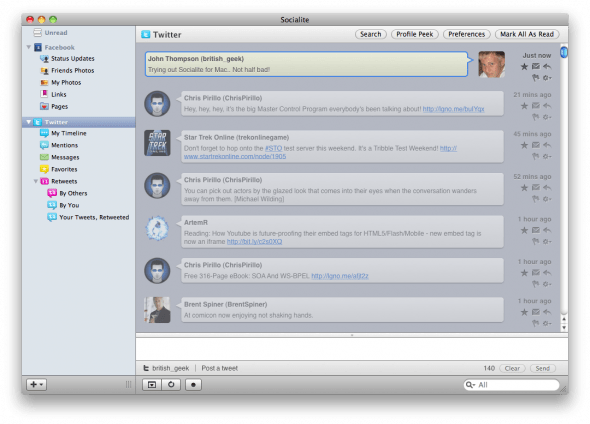 Yeah, me too, so I decided to try out Socialite for Mac OS X, an application which allows you to keep track of every single one of those feeds I just mentioned, as well as any other RSS feeds you want to add, in one window. Once you’ve downloaded the DMG file from the Real Mac Software website, installation is a simple case of drag and drop in to your applications folder. After you’ve installed it, you’ll have to set up all of your feeds within the application, so you can access everything in one window without having a million tabs open to access all of the content in your browser. If you’re setting up feeds such as Facebook and Twitter, which the vast majority of users will be doing, it’s a slightly more long winded job than simply entering your username and password. This is because you are then prompted to allow Socialite various rights connected to your account. When setting up a Facebook account, this involves numerous options such as posting information to your wall straight from the application and other rights, so you’ll need a good 5 or 10 minutes before you’re up and running on all your feeds. After spending all that time setting up your various accounts and feeds, you will want to actually make us of Socialite and interact with the content, right? Lucky for us, the developers got this spot on, allowing you to keep track of all your Facebook and Twitter happenings, as well as other services such as Digg and Flickr. If you’re a Twitter power user, you’ll be glad to know that there is support for multiple accounts too! You will have shortcuts to all of the services that you have activated on the sidebar, located on the left hand side of the window. These take place in the form of collapsible, folder like options, so you can expand individual networks, or view them all and scroll between them. When you select to view something, for example, all the status updates from Facebook, the main section of the window becomes the centre of attention, containing all of the feeds from your Facebook friends. You can not only view all of the status updates, but also like them, comment on them, and see all other comments that have been posted too. You can even upload photos directly from the application. There are, however, a few more things I’d have liked to see here. For example, it would have been great to have access to Facebook’s notifications system to know when people have commented on your posts or posts that you’ve already commented on. If you use a whole host of social networks, you’ll love to have the ability to handle everything straight from your desktop. It’s certainly a lot easier than toggling between an awful lot of tabs within the browser, and beats a lot of the other desktop clients too in terms of functionality, by supporting a ton of platforms. If you want to check out Socialite for yourself, you can download it from the Real Mac Software website, and buy for around £21 at the time of writing.